Helm’s special April Showers Sale is coming up for live bidding on Saturday April 6th, 2019. Over 300 Lots are hitting the action block. 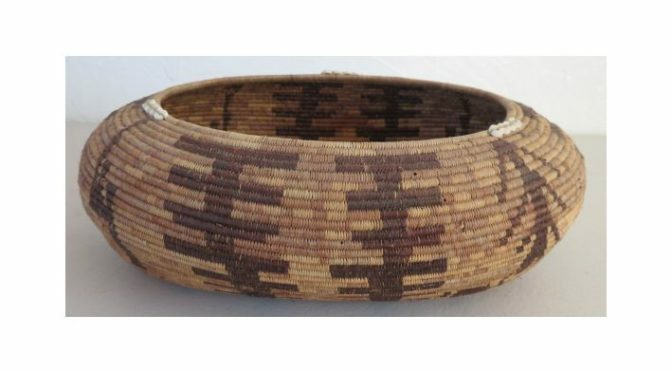 This catalog is offering Native American artifacts such as Navajo weavings and Pueblo pottery, Pre-Columbian artifacts, and other pre-historic items such as arrowheads and other stone tools. Also included are Oceanic and African tribal artifacts. This catalog also includes Native American and Mexican jewelry from the 20th century as well as many other items to include blades, antique weapons and art. Lot 40 is a great example of their selection of baskets. Helm is offering a Pomo Treasure Basket for an opening bid of $1200. This is circa 1900 and made of grass and shell. It measures 12” x 8” x 4” and in very good condition. There is a selection of photos in the online catalog. Helm Auctions show their auctions live from El Cajon, California. The event will begin for live bidding around 10:15AM Pacific Time on Saturday April 6th, 2019 Absentee bidding is available now and bidders can join the live auction from any internet enabled device. Helm Auctions had dedicated exceptional attention to this auction and will be able to answer all questions about individual items. The entire catalog is available today with photos and detailed descriptions ready for browsing.